Math Dice is a fast, fun game of mental math that helps students around the globe learn the power and flexibility of numbers. Originally called Dice Mania, Math Dice was invented for a school project by 6th grader, Sam Ritchie. To play, roll the two 12-sided dice and multiply the numbers together to get the target number. Then roll the three six-sided dice to get the scoring numbers. By using each scoring number only once, players must add, subtract, multiply, divide or even use powers to get an answer that is as close to the target number as possible. Although Math Dice is a simple game to play, the learning power is extraordinary. Now 15 years later, Math Dice has become one of the greatest math games ever and has become a “must have” for classrooms everywhere. Shortly after being released, Math Dice rolled its way into classrooms, specifically 5th-7th grade classrooms. Teachers love having a fun, exciting way to teach and reinforce math skills. And students enjoy learning through play. From simply playing a couple times a week during class to team-building exercises and even school wide tournaments, educators have found Math Dice to be an amazing classroom game and teaching tool. One school district in particular took implementing Math Dice to the extreme. 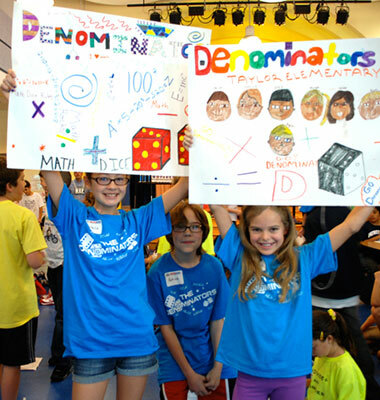 Now in its 13th year, the Arlington County Math Dice Tournament is one of the most anticipated events of the school year. For months, 5th graders in over 20 different schools hone their math skills by playing Math Dice so they can compete in the countywide tournament. Students celebrate the power of addition, subtraction, division, multiplication and even powers by competing individually and as teams. They even get into the spirit of this fun math game by singing and dancing their ways to win the legendary Rubber Chicken Award for school spirit. So far over 5,000 students have competed in this fun-filled dice game event. But more importantly, these students plus millions of others around the globe have significantly improved their math skills by playing Math Dice.